I suspect many of us have spent a happy few minutes jumping up and down to those Underworld lyrics at some time or another. Or maybe it was the Clash’s Police and Thieves; possibly even Surviving to the stirring tones of Gloria Gaynor. I guess it depends on when you were born, how long you kept up the clubbing, how in touch you are with your feminine side, or even how drunk you get at weddings. I drove down to Manchester today: About four hours in the car, taking the opportunity (iPOD on shuffle) to make myself hoarse, singing at the top of my voice to a myriad of tunes from across the decades. I love singing in the car. With the volume at a decent level you mercifully can’t hear your own voice, and it’s easy to imagine that you are actually there on stage out-Rebel-Rebel-ing David Bowie, or being lead backing on Elvis’s In The Ghetto, (“…in The Ghettooooo!…”). Sadly I’m not at all musical. If I was, and I could choose a voice to have it would have to be that of either David Bowie or Elvis Presley. How cool would that be? You’d never be able to shut me up! I often sing when I’m on route to fishing. It’s a great start to the day – shaking off the cobwebs, and getting you in a good mood. But the moment I arrive the music is turned off. I don’t need a soundtrack when I’m on the river. I once saw a salmon angler happily fishing his way down a pool wearing earphones. I don’t think there is a recording of Hugh Falkus’s Spey casting tips (“break the bloody rod in two!”), so I’m assuming this angler was listening to music. What a strange thing to do. Headphones are a great way to immerse yourself in music. But when fishing we’re attempting to immerse ourselves in nature. Having a soundtrack pulsing through the headphones is a needless distraction – I wouldn’t fish well, and I wouldn’t enjoy the music. A disaster on both counts. It’s the same with fishing videos. There’s a trend recently to over-dub most films with a pounding dance track, or a thrashing heavy metal riff. Too much! A 130 bpm garage/dubstep fusion (no idea what that may be, by the way), doesn’t make your video of you landing a six inch brownie any more exciting I’m afraid. The Trout Bum Diaries boys just about got away with it – but their fishing was spectacular too. I did really like the soundtrack to Tapam, nicely chosen and not at all intrusive. But if I had to fish along to that music live I don’t think I’d bother. 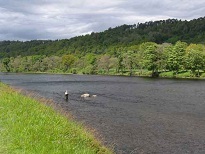 There was a big Salmon off the Tay last week. Forty pounds. I bet the lucky angler didn’t need the ghillie to sing Wagner’s Ride of The Valkyrie in his ear to enhance the drama.